I have a love/hate relationship with gallery walls. Meaning, I love the look of them, but literally hate every single attempt I've ever made to have one. I envy people who can throw together gallery walls and make them look totally awesome like this, this and this. We have this ENORMOUS wall in our living room that scales about 20 feet or so at the top. We love it! But it's a difficult wall to put anything on because it looks dwarfed. Also, there are no large architectural pieces or furniture that I have to work with. It's literally a blank wall. I've tried a few things on it but hated them. I didn't hate the first. But it was too much for some reason...and that Home Sweet Home thing was at the top. Which made it weird. Plus it was too small scale for the wall. I hated the second one. It was plain and weird and had no "theme". I hated looking at it. So I finally bit the bullet and decided to try doing my gallery wall the proper way. If you look up how-to make a gallery wall, the basic gist of the process is you trace what you have onto large sheets of paper and hang them on the wall with painter's tape to get an idea of layout. Then you nail holes into the paper and then rip the paper off. Hang your art and it's done. I traced all my stuff onto posters and laid out a design I could live with. It's pretty squareish...not any cool angles or asymmetrical...but again, Type A, here. Yes, the cow print is named Francine. I love it. Once we got a placement we could live with, we went ahead and hung the art and such. You'll see that the wood block for M's antlers. I wanted to mount them so they could be hung on the wall. Initially I thought I might paint the wood block but I ended up liking it natural. I wanted to incorporate some photography, some paintings and other non framed elements like the wood hanging thing, antlers and the P.
I think I still need something for underneath the jelly to the left of M's antlers...but I'll find something eventually. Overall, I'm happy with it. It's very rectangular, which I was worried about initially, but upon further Pinsearch (Pinterest Research) I've discovered that a rectangular gallery wall isn't that uncommon. 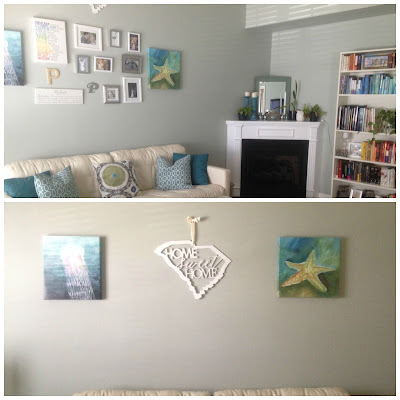 Have you ever attempted a gallery wall? I like it a lot! Good mix of stuff. I have one going up my stairs. It is unconventional in that things did not get spaced out, they just got plopped. I like it like that since it's uneven space with the walls going up anyway.